Born in Toronto, Adam Arruda has been surrounded by music from a very early age, growing up in a musical family. Adam began playing the drums at the age of 3, and began studying music via the ORFF method at the Royal Conservatory of Music in Toronto at 5 years of age. 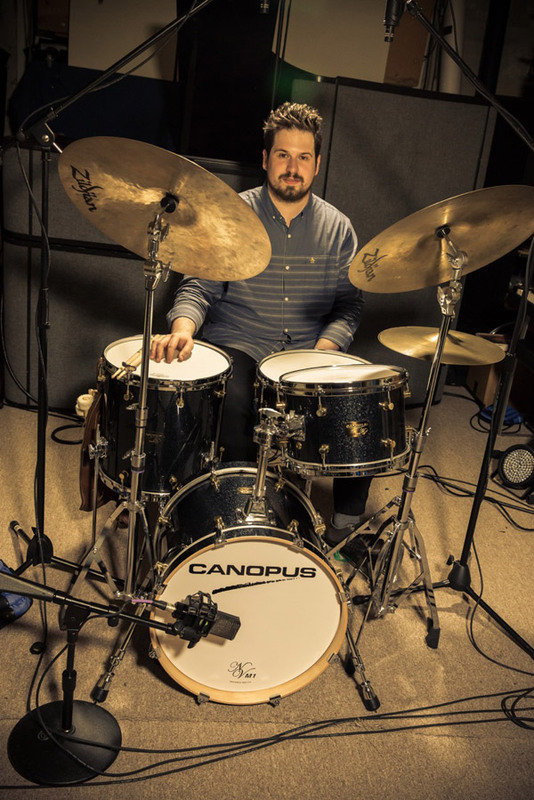 Later that year Adam began taking drum lessons with Steve Mancuso and playing in Jazz combos at the Humber College Community Music School, led by Cathy Mitro. By his teenage years he was already actively working on the local scene, and began leading his own combo at Humber. Adam received the prestigious Zildjian Outstanding Young Drummer and Combo Drummer Award from 2001-2008 at Music Fest Canada, as well as other honorary awards, and played in the Yamaha All Star Band from freshman year until senior year while he attended Claude Watson School for the Arts. At Claude Watson, Adam gained experience playing in Symphonic Band and delved even deeper in his studies. While in high school, he played in the Jazz FM Youth All Star Band every Saturday, in his senior year. He also attended the Brubeck Summer Jazz Colony in 2006 and 2007, the Vail Summer Jazz program, the School for Improvised Music, the Creative Music Workshop and other workshops in the U.S.A and Canada. In 2007 Adam was invited to the Grammy Awards to perform with the Gibson/Baldwin Grammy Jazz Big Band, and was chosen to study at the University of the Pacific for one year as a Brubeck Institute Fellow along with four others in 2008 under Joe Gilman on full scholarship. Now residing in Brooklyn, New York, Adam is among the most sought-after drummers in the music world and has had the privilege of working with such artists as Greg Osby, 3WI, Dayna Stephens, Gilad Hekselman, Sam Yahel, Simona Premazzi, Joshua Crumbly, Nick Hempton, Orlando le Fleming, Glenn Zaleski, Tomoko Omura, Kevin Eubanks, Romain Collin, Luques Curtis, Florian Hoefner, Todd Bashore, James Moody, Phil Woods, Tom Scott, Orrin Evans, Godwin Louis, Nick Hempton, Randy Ingram, Alice Ricciardi, Yasushi Nakamura, Jeremy Pelt, Will Vinson, Corcoran Holt, Bill McHenry, Philip Harper, Erena Terakubo, Jason Palmer, Billy Buss, Sarah McKenzie, Ralph Alessi, Sean Wayland, Matt Marantz, Jonathan Kreisberg, Yotam Silberstein and many more. Adam has performed at the 2007 Grammy Awards, 2004 North Sea Jazz Festival, Detroit Jazz Festival, Monterey Next Generation Jazz Festival, Brubeck Jazz Festival, D.C Jazz Festival, The Kennedy Center, Leuven Jazz Festival, Blues Alley, The California Hall Of Fame, Wally’s Jazz Club, The Green Mill, Bohemian Caverns, The Rex Jazz and Blues Bar, The Cellar, Smalls Jazz Club, Minton’s , Fat Cat, Jazz Standard, The Jazz Gallery, National Arts Center, Smoke, Yoshi’s, Jimmy Mak’s and many more venues and festivals. Aside from performing, Adam also teaches private lessons and ensemble playing to all ages. Adam is also a proud endorser of Vic Firth drumsticks. My Canopus NV-60 M1 drums are nothing short of beautiful, with a vintage soul and a modern sensibility. They are chock-full of a warm and fat, full and round tone that has body whether you are behind the kit, or in the back of the club, and hands down the most amazing snare drums I have ever played, with a naturally dry rich tone, and fast response from their beautiful snare wires. Solid drums and perfect ightweight hardware as well. I love Canopus, and everything they stand for, it is such and honour for me to join this family, and look forward to playing and being inspired by Canopus Drums all around the world!